The Devil Stick is also known by a number of other names such as a flower stick, stunt stick or rhythm stick (each is slightly different, but perform largely the same purpose which is to dance under the control of your handsticks. Devil sticks have nothing to do with the devil. The name comes from the Greek word “devil” meaning “to throw across”. The Devil stick can defy gravity because when you hit a contact point (one quarter or three quarters of the way up), the devilstick gets a little lift. Kneel with the devil stick standing upright. 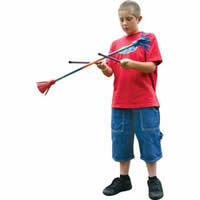 Using just your hands, toss it back and forth so that the bottom end of the devil stick does not leave the floor. Keep your hands a good distance apart so that the devilstick is almost touching the ground before it is caught. Now use the handsticks in place of your hands. Catch the devil stick on your handstick 3 quarters of the way up and throw it to the other handstick (while still keeping the bottom of the stick firmly on the ground). You should be allowing the devil stick to rest gently on each handstick, like you are throwing and catching the devil stick, rather than hitting it left and right. You should now be able to start from a kneeling position, and slowly stand up whilst tapping the devil stick. Try to keep the movement slow and even. If the pattern becomes fast, this could be because the handsticks are too close to each other, or that you are hitting the devilstick instead of lifting it. From a normal start where the devil stick is moving from handstick to handstick, you need to throw the devil stick with a little more force to your other hand, and this will give you time to bring your handstick up and under the devil stick to catch it horizontally. 360 Spin Try lifting your hand even higher and with a bit more force, if you would like the devil stick to do a 360 degree spin in the air and be caught again. Pirouette Throw the devil stick up in the air and spin yourself round 360 degrees! Toss and Cross When you throw the devil stick straight up, you could cross your arms over, and catch the devil stick again. Arm Roll Roll the devil stick up your arm and then back onto the handsticks! Arm Roll to Behind Back Roll the devilstick up your arm, then duck your head and let the devilstick continue rolling. If you lean forward, you can let the devilstick roll slowly down your back, which gives you enough time to invert your hands so that they can catch the devilstick when it rolls to the base of your spine! Behind the Back Catch Instead of rolling the devilstick to behind your back, you are now going to throw it to that position! This will take a bit of practice, and it may hurt as you try and quickly twist your arms into position. Be careful that the devilstick doesn €™t come down onto your head! Up to yourself how you get out of this trick once you have caught it behind the back! Handstick Tricks When you throw the devil stick straight up, quickly spin both handsticks in your hand (or flourish or throw) before catching the devil stick once again. Body Bounce Drop devilstick onto a foot and kick back up onto stick. If you kick it lightly in the centre, the devil stick will rise smoothly. If you kicked it slightly off centre, then you could perhaps get it to do a flip before returning to the stick, or you could indeed kick it up ready to do all the vertical devil stick stuff! You can also bounce the devilstick off your knee, elbow, shoulder and head! Spectac-U-Lar If you wear glasses, then move them slightly forward on your face, then roll the devilstick down your arms so that it will come to rest on top of your specs! This is a good comedy trick. Spins allow you some time to do other tricks when the devil stick is in the air and they also look great! Single Spin: Get a steady rhythm going and then push and lift a little harder with one handstick to make the stick do a half turn. Double Spin: You require a bit more force than for a single spin (experiment until you get the right amount)! The stick should do a complete 360 degree turn, before it lands at your other handstick. Propellor The devil stick rotates continuously around one hand stick (just like an aeroplane propeller). In order to do this, tap the devil stick across from your weaker hand to your favoured hand, and when it arrives, instead of knocking it back, keep it spinning in the same direction by circling the devil stick with the hand stick and pushing it up just below the middle each time it comes around. Remember that you can rotate the devilstick clockwise and anti-clockwise in each hand, so there are 4 different directions to master! This is a difficult trick for many people so don’t be surprised if it takes a while to learn! 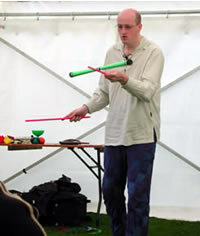 Juggling You have 3 objects in your hands (two handsticks and one devil stick), so it is possible to juggle them! You may have to experiment a little if you want to add this trick to your devil stick routine, as you will need to find a way to get into and out of this trick! You should build up to being able to juggle 3 clubs before attempting this trick. You would then simply throw the devil stick high at any point in your routine and begin a cascade pattern. Flourishing When you have a handstick free (eg the devil stick is on its way to the other handstick), you can “flourish” (twist the handstick round your fingers, throw it in the air, turn it round etc). Trapping / Double Sticking The devil stick is hit at two different places simultaneously. One handstick hits the devil stick one quarter of the way up, and the other handstick hits the devil stick three quarters of the way up. The devil stick is far more stable when you use double sticking, and less likely to run away or towards you. Under the Leg Throw a single spin to gain some extra time, then quickly lift your opposite leg, reach under your leg with that handstick, and catch and toss the devil stick back to the other hand. Practice this trick until you can do it fluently under either leg. After some practice, you may find that you can “jog” in place hitting under the leg with alternating right and left handsticks! Horizontal Balance Place the middle of the devilstick on one handstick so that it is lying horizontally across. Try to balance it. You may find that the exact middle of the devilstick isn’t exactly where you think, and it can be useful to mark the exact middle with a marker pen so that you can locate it easily in future! Balance Balance the stick upright on a handstick, then try to spin it over and catch it once again in the upright position! Balance Tricks Sent in – keep them coming! Orbit’s Axis Hold one handstick for this trick. I start out with a propeller and make the devil stick rotate counterclockwise. I then start walking around the devil stick. I have the devil stick propelling in front of me, then I step to the side of the propeller, which means that I am now doing a one-handed saw with the end of the devil stick coming up and in towards me face and back down and around again. Then while I am doing the saw, I side step the saw yet again and continue with the propeller. This time however I am spinning the devil stick in a clockwise motion. You can continue to walk around the devil stick as much as you like. The devil stick never changes it’s direction of spin. The only thing that changes is where I stand. One handstick is now doing the work of two! There are over 50 variations of single stick moves, so this section was written to help give some ideas! Inside-The devilstick is on the hand stick and is between the two handsticks like in a normal Tick Tock. 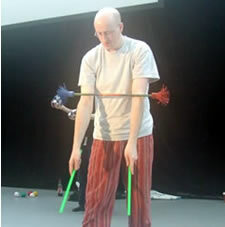 This section of single stick tricks was written by Brian Hirschberger from Portland (USA). – Thanks!